A few experiences in my life I have had solely because of my CP. They include seeing the White House kitchens, competing in a national championship tournament, being a student-athlete for my favorite school, and knowing, being friends with, and even playing with, or against, some of the greatest athletes in the world. In addition, in what can be a blessing or a curse, your professors know exactly who you are even in a class of 300 people! Everyone has a slightly different perspective; however, CP helps differentiate your perspective even more. I usually feel as though I can add something to a class discussion that no one else in the room would even consider. Furthermore, it is always surprising to me how often I turn to disability related topics when doing work for school. Many of my best papers have covered the impact of people with disabilities or issues surrounding disability. As a senior in college, I had to write a Senior Thesis that was completely original in nature and unique in its analysis of history. I was scrambling for a topic. In the end, I finally settled on how the Controversy at the FDR Memorial illustrated a shift in power to the disabled community that had occurred. Without my disability, I might not have graduated when I did! While my CP does not define me per se it is, and always will be, a large part of who I am. Life with cerebral palsy is the only life I know. CP is a fundamental element of me being me and affects everything I do both the good and the bad. Therefore, if it suddenly went away I literally would have no idea what to do! Is life with CP all fun and games? No, but neither is any other type of life either. We all have things we live with everyday that make life somewhat challenging whether that is diabetes, spina bifida, being bad at math, being clumsy and unathletic, or cerebral palsy. If all of life was easy then we would not appreciate the accomplishments that we achieve and where is the fun in that? If you have CP would you change it? Would you remove it completely or just certain parts? Which parts? My Cerebral Palsy is not anyone else’s and CP affects each person differently. I personally would not change my CP but someone else might. That is perfectly okay as everyone is entitled to their own opinions and choice. Phillip Crain graduated from Auburn University in 2014 with a BA in History and he is currently in graduate school there pursuing a Masters in Administration of Higher Education with a concentration in Sports Management. 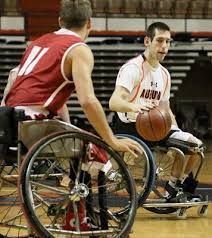 Phillip is also a member of Auburn’s Wheelchair Basketball Team. When not in class, he enjoys watching sports, water-skiing, reading, and traveling. Oh, and he has Spastic Diplegia Cerebral Palsy. If they build it, will I purchase? What Does that Term CP mean to You? Phillip, thank you so much for being an example of using all your ability to move forward in life. Keep up the good work.